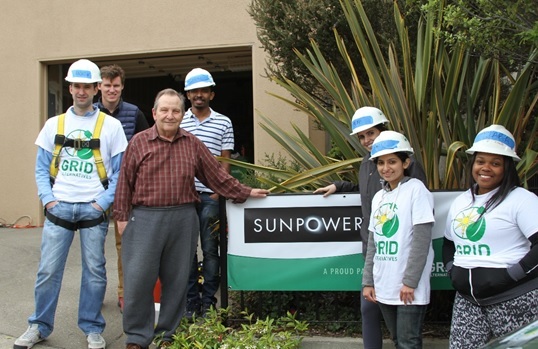 This summer a group of SunPower interns traded their business attire for hard hats and work boots and joined nonprofit GRID Alternatives at the home of Ben Bayol in San Francisco to get their first taste of installing a solar energy system. The volunteer project, one of five so far this year with SunPower® employees and interns, came on the heels of SunPower’s recent announcement of an expanded partnership with GRID Alternatives to support our work making solar power and solar job training accessible to underserved communities and to help launch our Solar Futures program. SunPower has been a partner of GRID Alternatives since 2006. Since then, nearly 950 families in California, Colorado, the New York tri-state area and the Mid-Atlantic states have benefitted from the relationship. With a combined 2,300 kilowatts of energy installed, these families are expected to save $17 million over 25 years, the expected lifespan of a SunPower system. Through the partnership, GRID Alternatives has also provided solar training to more than 21,000 individuals, including hands-on installations. Solar Futures will expand on GRID Alternatives’ work in high schools, providing both classroom and hands-on solar training to K-14 students, with a focus on high school juniors and seniors in California’s Inland Empire and Central Valley regions. For the SunPower interns at Bayol’s house, the day started early with an on-site safety talk and then shifted to preparing the roof for solar panels and other tasks on the ground. While the interns and GRID’s volunteer team leaders were working, Bayol prepared lunch for the crew. Like many GRID clients, Bayol learned about the program from his neighbor. GRID provides the systems to qualifying homeowners at no- to very-low-cost, making it possible for them to switch to solar to reduce their energy bills. For families with low and fixed incomes, energy costs can be a significant burden; solar power frees up money for other basic expenses such as food, medical bills and home maintenance. And, with GRID’s volunteer installation model, the benefits go beyond the homeowner. It’s a real learning experience for volunteers and solar job trainees alike. SunPower finance intern Saili Deshpande, a student at the University of Arizona, shared her thoughts about the volunteer experience. With the Solar Futures program, that learning opportunity will now be extended to high school students. In addition to a classroom curriculum and training for careers in the growing solar industry, the students will do solar outreach and education in their own communities and help low-income families benefit from solar. Thank you to SunPower for your long-term investment in GRID Alternatives and for helping make the transition to clean energy one that includes everyone. Guest blogger Julian Foley, Director of Communications for GRID, enjoys sharing stories about the impact GRID's partners make in the community. Visit GRID’s website for information about how to apply for their program or to volunteer.